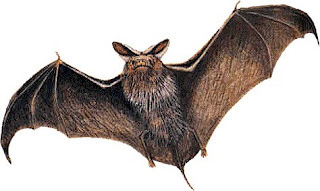 Home » animals , bats , elon university » Elon dorms plagued by bats! Elon dorms plagued by bats! I just had to post about this 'cuz I'm an Elon alum and have friends from there who read this blog: Virginia, West and Sloan dormitories at Elon University have been invaded by bats. Fourteen students already moved in but had to evacuate for two days while the bats (mostly in Virginia) were removed. Elon's fine maintenance crew (you know, the ones who have to paint the grass green whenever the school's honchos come to visit) installed a gadget that emitted sonic frequencies which drove the chiropterae to flee the premises. Then various holes in the dorms were patched up with caulking so that the bats couldn't get back in. You thought Smith was scary? I lived just *one* semester in Jordan Center. I'm still in therapy over it.